Thanks for joining us for another great RoofJamz House Concert and party! We are looking forward to seeing you March 9th and sharing the awesome music of Jimbo Scott, The Real Sarahs, and Mike Rufo & Friends. This show will also coincide with Mike's birthday week so plan to stay and dance a while in the good times. Suggested Donation: $20 (all proceeds go to guest artists Jimbo Scott, The Real Sarahs). No one turned away for lack of funds. 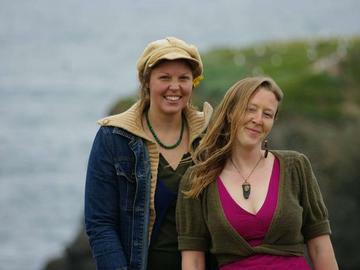 As rising stars in the west coast Americana scene, The Real Sarahs have begun to distinguish themselves as master harmony singers and evocative songwriters. With an organic sound that enchants and uplifts the spirit, they share their special gift of vocal synergy. This duo creates magic with voices in harmony, acoustic instruments, and the energetic connection between artists and audience. Embracing many genres of music, you are likely to hear threads of folk, jazz, blues, and country running through their songs. Singing from the stories of their own life journeys and experiences, their original music is honest, evocative and heartfelt. Mike Rufo is a songwriter and activist whose songs arc across the waves of life. His musical language builds upon powerful lyrics, soaring vocals, varied rhythms, and captivating melodies to explore emotional depths and personal transformation, leaving listeners deeply enlivened and fired up. Mike's recent album, Nothin' But Now, features a return to his early folk roots. As noted in The Prelude Press: "The songs on Nothin' But Now weave together in deeply resonant and beautifully conveyed stories of uplift, loss, transformation, and connection."